Young men look for metal at the site of an abandoned lead mine in Kabwe, Zambia. When rich deposits of lead were discovered near Kabwe in 1902, Zambia was a British colony called Northern Rhodesia, and little concern was given for the impact that the toxic metal might have on native Zambians. 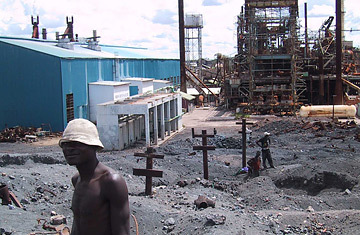 Sadly, there's been almost no improvement in the decades since, and though the mines and smelter are no longer operating, lead levels in Kabwe are astronomical. On average, lead concentrations in children are five to 10 times the permissible U.S. Environmental Protection Agency levels, and can even be high enough to kill. "We did blood tests on some of these kids, and they literally broke our machines," says Fuller. "There is a long, nasty history here." But there's also a bit of hope: the World Bank has recently allocated $40 million for a clean-up project.